Venezuelan President Hugo Chavez on Wednesday blasted accusations that his government supplied Colombian guerrillas with shoulder-fired anti-tank weapons and accused the neighboring country of blackmail. The remarks follow a freezing of diplomatic relations between the countries over the weapons issue and over negotiations that could lead to American military bases in Colombia. Colombia announced last week that three anti-tank weapons seized from the Revolutionary Armed Forces of Colombia, or FARC, had been traced to Venezuela. “What a coincidence that this information comes from Colombia one day after we started to raise our voice against the installation of Yankee bases in Colombian territory,” Chavez said at a televised news conference. “Of course this is not a coincidence,” he said. “This is the government of Colombia trying to blackmail us.” Chavez said that Venezuela feels threatened by the possibility of the United States having military bases in Colombia and that the accusations were designed to discredit him. “It was a dirty move,” he said. The Venezuelan president said he doubted the authenticity of the weapons that Colombia recovered but left open the possibility that they had been stolen by Colombian guerrillas during an attack on a Venezuela naval outpost in 1995. Both the Venezuelan and Colombian governments had lists of the weapons reported missing after that attack, which included the same model of anti-tank AT4 weapons now in question, he said. 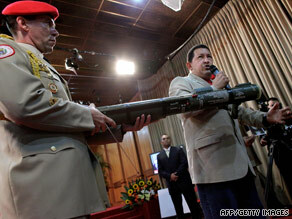 Colombian President Alvaro Uribe has also said that the guerrillas were trying to buy anti-aircraft missiles. Chavez responded last week by recalling Venezuela’s ambassador to Colombia, as well as most of the embassy’s staff. Tensions between the two countries have been high since March 2008, when Chavez ordered tanks to the border in response to a Colombian attack on FARC bases in Ecuador. More recently, Chavez has severely criticized Uribe for entering into negotiations to allow the United States to open military bases in Colombia. The United States says it needs the bases because Ecuador has ordered the closing of a U.S. installation there. Chavez accuses the United States of wanting the bases so it can attack Venezuela. This is not the first time Venezuela has been tied to the FARC, which has been fighting the Colombian government for more than 45 years. Last fall, the U.S. Treasury Department accused two senior Venezuelan intelligence officials and a former official of providing weapons to the FARC and assisting the rebels with narcotics trafficking. The United States identified one of the individuals as Hugo Armando Carvajal Barrios, director of Venezuela’s Military Intelligence Directorate. Another individual was identified as Ramon Emilio Rodriguez Chacin, who was Venezuela’s minister of interior and justice until September.